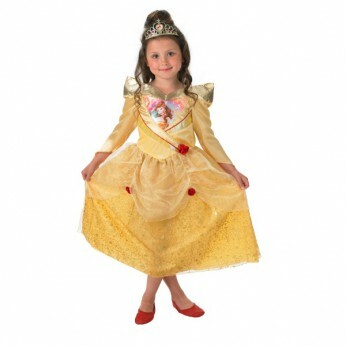 Dress as your favourite Disney Princess in this wonderful costume from Rubies Masquerade! Includes Deluxe Dress with Glitter print detail and jewelled tiara. Available in Belle, Cinderella, Sleeping Beauty, Rapunzel, Snow White and Merida. To fit 5-6 years…. This toy costs approximately £16.99 (for the latest and best prices make sure you check our retailer list for the Shimmer Golden Belle Dress above). In our review of Shimmer Golden Belle Dress we classed it as being suitable for ages 3 years, 4 years, 5 years but recommend you check the manufacturer specific advice before purchasing.